So-called bifacial stem cells are responsible for one of the most critical growth processes on Earth – the formation of wood. By alternately developing into wood and bast cells, these stem cells are thus starting points for forming wood as well as generating plant bast fibres. A team of researchers under the direction of Dr. Thomas Greb, a Heisenberg Professor at Heidelberg University, were recently able to demonstrate this phenomenon using new experimental tools. The scientists from the Centre for Organismal Studies labelled and studied specific types of cells in the growth layer of plants, the cambium. Life on Earth is fed by energy from the sun. Plants are the primary and most important recipients of this energy, converting it into sugars and biomass that are then utilised by animal organisms and humans alike. The process by which most of the biomass is stored long-term is wood formation. Wood is produced from a thin layer of stem cells called the cambium, which is located directly under the bark of shoots and roots. It produces both wood and plant bast, which is often used in the fibre industry. "Although it has an essential role in the Earth's materials cycle and supplies important materials for our daily lives, how the cambium functions is largely unknown," says Prof. Greb, who heads the Developmental Physiology research group at the Centre for Organismal Studies. 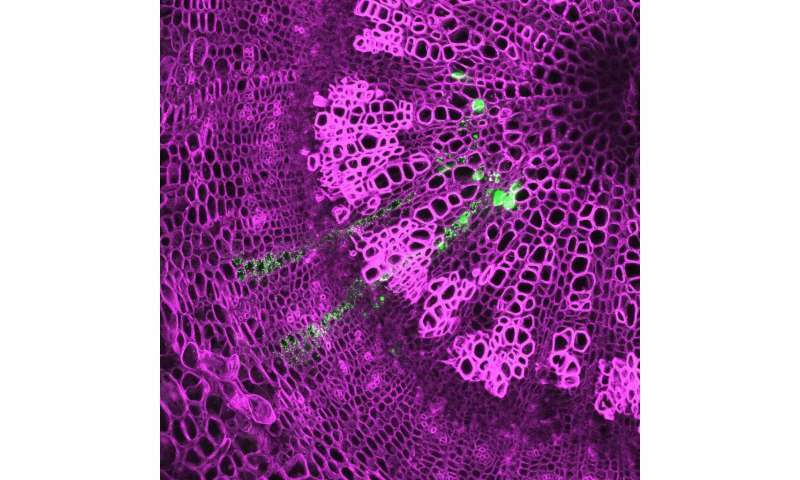 By labelling different cell types inside the cambium, the Heidelberg researcher and his team identified the cells that are the source of both tissues – the wood (xylem) and the bast (phloem). These bifacial stem cells produce cells bidirectionally, with wood cells growing inward and bast cells outward. To label the stem cells, the team used fluorescent proteins that helped identify the activity of specific genes. Using a molecular "trick," the researchers were able to firmly anchor the labels in the cells and all their descendants, enabling the team to track and reconstruct cell development over a longer period of time. By improving their understanding of how these cells work, the researchers hope next to be able to model plant growth and uncover the regulatory mechanisms of cell properties. The results of the research were published in the journal Development. The article is associated with an interview with Prof. Greb and Dr. Dongbo Shi, the study's primary author.